Note the slate grey head and neck with the distinctive white crescent. 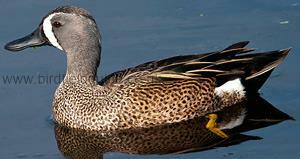 Beware of Male eclipse Northern Shoveler who can also have a similar white area behind the bill. The breast and flanks of the Male bird are also different colours, although the contrast can vary. 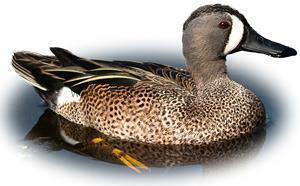 The Male Blue-winged Teal in Winter has a white crescent behind the bill with a slate grey head. It's body is mottled brown and it's bill black. 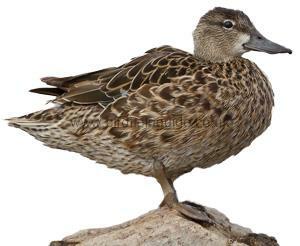 It is a small duck only slighter larger than the Eurasian Teal. It has a distinctive area of white on it's rear flank. 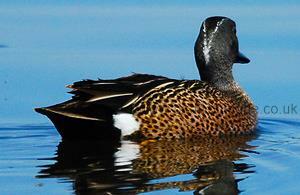 A dabbling duck, the Blue-winged Teal migrates from North America/Canada to Southern America in the Winter. As a vagrant the Blue-winged Teal often accompanies Shoveler or Eurasian Teal on freshwater ponds, lakes and flooded grassland. An American and Canadian bird the Blue-winged Teal is rarely seen in the UK or Europe with only around 1 to 14 sightings per year. Some of these sightings are thought to be collection escapees. The Male Blue-winged Teal when seen from behind has a distinctive V shape on the back of the head, however the mark is not always prominent depending upon the stage of plumage. The white patch on the Males rear along with the dark rump and tail are clearly illustrated in this image. Male and Female Blue-winged Teal in Winter. 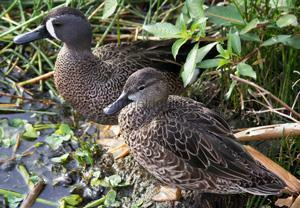 The Female Blue-winged Teal is very similar to the Female Eurasian Teal and the Female Garganey. The pale loral spot, broken white eye ring, eyestripe and leg colour help to separate it. The Female, like the Male has a blue forewing but it tends to be slightly darker. The Male in Summer eclipse is almost identical to the Female, the leg colour being the most reliable way of separating the sexes. The Males blue wing is a lighter blue than the Females. 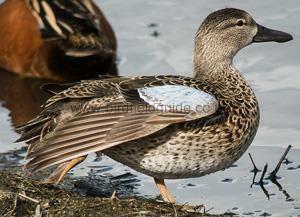 To further complicate identification the Male in Summer is also very similar to the Female Garganey and Eurasian Teal. See ID points on Female below. The Male and Female Blue-winged Teal are easy to separate in Winter with the Male having distinctive plumage. 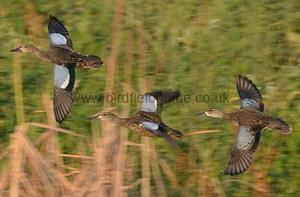 The Male and Female Blue-winged Teal in Winter are easier to separate whilst in flight. The female at the back has a much smaller white wing bar, and the blue forewing is much duller than the two Male birds at the front.